The field of magnetic resonance imaging has been undergoing a transformation during the past decade, with a growing emphasis on characterizing disease using imaging metrics of more direct physiological relevance, i.e., quantitative imaging biomarkers. As a result, the complexity of clinical magnetic resonance imaging techniques and the availability of new image sequences have increased dramatically in search of these biomarkers. Two critical challenges have emerged during this transformation: 1) how does the clinic acquire increased amounts of imaging data within a clinically reasonable amount of time? and 2) how does the physician assess this increased volume of data in a time-efficient manner? To address the first challenge, parallel imaging (pMRI) was developed as a class of image acquisition and reconstruction schemes that serves to increase the amount of imaging data acquired within a given time. While the use of pMRI is becoming widespread clinically, the complexity of the technique can lead to corrupted, nondiagnostic images if not utilized properly. 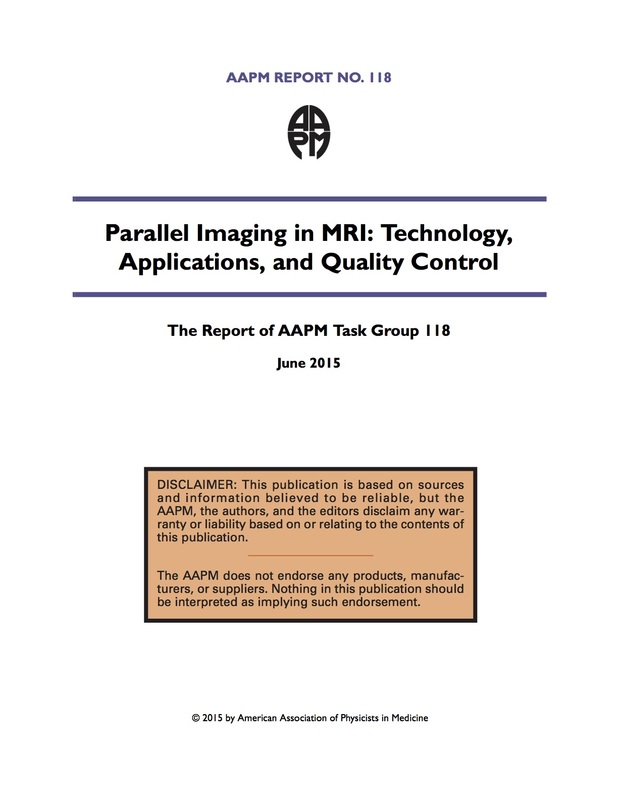 This document is the report from Task Group 118, formed in order to help educate the medical physicist about the technique of pMRI, and about how this technique can affect image characteristics. Important topics that are addressed within this document are clinical uses of pMRI, artifacts, and properties of phased-array coils (which are strictly required in pMRI). This report also enumerates and describes specific quality assurance concerns that arise with the use of pMRI, although a comprehensive treatment of pMRI-based QA procedures is beyond the scope of this report.